Can you test your employees for drug and alcohol use? Who can you test and when? What substances can you test for? What about marijuana in states where it has become legal? Navigating this fast-changing area of employment law can be especially tricky. 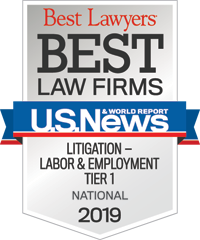 To help you navigate this complex issue, Constangy has a team of attorneys that stay up-to-date on the latest federal and state laws and policy guidelines. We can work with you to make sure your drug and alcohol policies and testing processes meet all federal, state, and local legal compliance requirements; reduce your organization’s liability risk; and help you maintain a safe, drug-free, and effective workplace. We assist with customized federal- and state-specific policy and forms toolkit development; DOT regulations and state drug testing laws in all 50 states; onsite supervisor training and distance learning; assist with compliance; and provide advice on hiring and severance procedures. Click here to view drug testing related training webinars. Click here to view related blog posts. For more information, contact Tommy Eden at 205.222.8030 or teden@constangy.com. What personnel can you test? What substances can you test for? Can you test with instant products or use lab services, or both? Can you complete collections onsite or send your personnel to off-site collection facilities, or both? Under what circumstances can you drug and alcohol test? Complete the applicable intake form below, and email to Tommy Eden at teden@constangy.com or Emily Andrews at eandrews@constangy.com. You will receive a flat-rate price for your customized policy and forms toolkit project within 48 hours, or a contact for further information. Work on your project will not begin until you have confirmed a flat-rate engagement agreement with Constangy.